Fashion’s shift towards the streets in recent years is understandably concerning for any man who’s spent half a decade cultivating a solid tailoring rotation. But just because it’s now perfectly acceptable to look like you’ve just left a rave or the gym pretty much any hour of the day doesn’t mean those double-monks and three-pieces need to be sent into storage. High-low dressing is the art of combining formal and casual clothing in a way that strips the former of its stuffiness, and the latter of its off-duty appearance. However, striking the right balance is tough. For every Justin Timberlake, accessorising a perfectly cut two-button suit with white leather sneakers, there’s an Ed Sheeran, looking like he turned up late to a family wedding and had to wear his dad’s spare suit with the Air Jordans he wore on the train. Sorry, Ed. Avoid making the same mistake by following our guidelines, which will ensure your style’s more up-down than down and out. There’s a reason this is the uniform of most fashion designers; it lets you show off both your wardrobe nous and the fact that you don’t have a boss demanding you follow a buttoned-up dress code. Opting for timeless, neutral tailoring is advisable here and will win the benefit of the doubt if you don’t quite nail the fit or colour matching. Monochrome should be the first step on the collarless road – a grey suit and white T-shirt is a tough thing to mess up – but as your confidence grows, start experimenting with colours and patterns such as a Breton stripe. It’s best to keep the eye-catching stuff to the base layer (i.e. the T-shirt), as there’s less of it on display, and stick to classic crew necks over anything that plunges towards your navel. For an advanced look, try a longline version for a smarter take on reverse layering, or tuck the T-shirt into your trousers for a clean finish. Thanks to the rise (and rise, and rise) of athleisure, the T-shirt is arguably getting more air time than ever before. So much so that wearing this casual staple with pretty much anything tailored is now considered a power style play. For a slightly more casual-leaning (but no less sharp) version of the suit and T-shirt combo, ditch the jacket and create a solid foundation that can be dressed up or down with accessories. A word of warning: with this pairing fit becomes even more vital. Even an inch of extra fabric will make it look like you just pulled clothes out of the wardrobe at random. 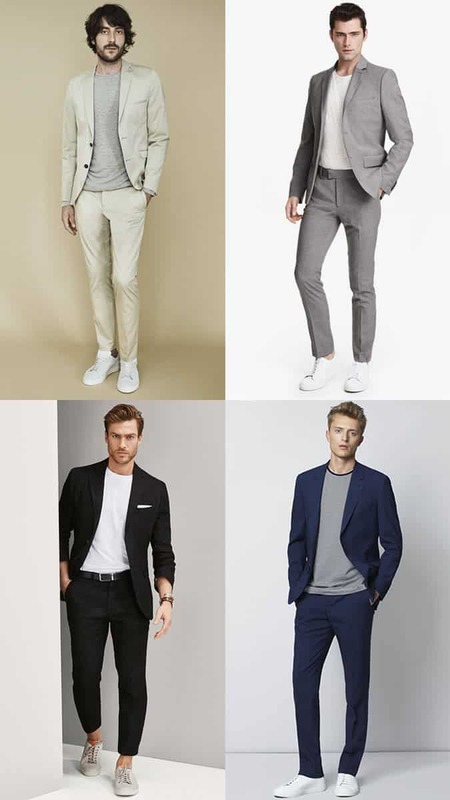 Ideally, the trousers should be in a modern, slim cut with little to no break, while the T-shirt should be neither skin-tight nor baggy with arms that hit the halfway point of your upper arm. As ever, the devil is in the detail. Choose beltless trousers for a more streamlined aesthetic and add a watch or leather folio in a colour that complements either the top or bottom half. Too many men dress high-low by accident, wearing a pair of knackered trainers with a suit because they couldn’t find their proper shoes; or worse, finding those shoes but pairing them with bootcut jeans. But denim is a power player in the high-low wardrobe when done right; especially when worn with a blazer. After all, what better way to contrast the uniform of high-flying executives than with the workwear staple of (quite literally) low-down miners? In this case, to avoid looking like a man that owns square-toed shoes, opt for slim-cut denim in a mid-to-dark wash with minimal detailing (no ripped knees, extreme distressing or raw hems). As for the blazer, an unstructured example will tie the two opposing pieces together, but a more structured jacket can be worn if the gap is bridged with a smart-casual piece, such as an open-necked shirt or polo. If you are a man that owns square-toed shoes, burn them. Then reach for simple sneakers or Derbies and decide whether it’s hot enough to flash some mankle. Throwing office outerwear over off-duty staples can make it look like you were in a rush to leave the house and grabbed the first coat by the door on your way out. So, as with any high-low combination, the balance needs to appear deliberate. Sling a topcoat over a pair of slimline wool joggers and a cashmere sweater, and suddenly it looks like you picked the weather-beating outerwear for practicality but haven’t sacrificed style for comfort. An unbelted trench or mac or slightly oversized, raglan sleeve overcoat plays up that relaxed air, but making sure the sleeves are fitted (and there’s a flash of sweatshirt cuff peeking out) tempers the roomier shoulder and body, so it doesn’t look like a hand-me-down. As for what lies beneath? 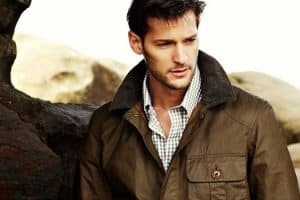 Stick to high-end streetwear staples such as marl loopback sweatshirts, luxe hoodies (cashmere and merino wool versions look as good as they feel), zip-up track tops and soft cotton T-shirts for the top half, and either raw jeans, slim-fitting chinos or on-trend tailored joggers for the bottom. High-low dressing can breathe new life into a wardrobe that’s feeling a bit uninspired and allows you to utilise key pieces in new ways. Nowhere is style fatigue more prevalent than within the work wardrobe, where the same stale combinations are often worn like clockwork. For a step up from playing with the colour, texture and patterns of shirts and ties, try swapping out the suit jacket for a more casual piece of outerwear. Subbing in a bomber, leather or denim jacket is a solid way to inject some energy into day-to-day office looks and makes the transition to the afterhours much more seamless. To best pull this move off, opt for a jacket cut with the same attention to fit as a blazer – the denim jacket is famously trim, while the shoulders of a leather jacket should never sag down the arm. Textured and knitted ties tend to work better than traditional silk versions in this look, but shirts are fair game – from standard office fare to button-down Oxfords, chambray and even flannel. This seemingly simple combination too often veers towards looking like a salesman who changed into his comfy shoes for the commute home. Firstly, the suit: it should fit like a glove – smart shoes can play down extra material, but trainers won’t – and you should steer clear of anything that’s too ‘out there’. The sneakers are enough of a statement without adding in bold checks or a neon paisley pocket square. The same rules apply to the footwear. Keep technical trainers in your kitbag; this is when to unleash those minimal leather sneakers you dropped half a month’s rent on. White should be the default option as these will sit happily beneath anything from formal black tailoring to an everyday navy two-piece. Playing with colour and fabric is a more advanced move and, as with formal shoes, should offer a contrast in texture. Try suede with flannel, or canvas with linen. Just make sure to invest in some fabric protector to keep what’s on your feet looking box fresh; beaten up Converse and a skinny suit is a little too mid-noughties indie front man. Most importantly, wear this combination with rock-solid confidence. Lose the socks, roll the cuffs, go tie-less – just do it with a sense of swagger to show people that you know the rules, you just don’t follow them. Despite the short suit’s increasing prevalence, sun’s-out-calves-out tailoring isn’t for everyone. Or, really, anyone who isn’t Pharrell. Non-matching shorts and blazer separates, on the other hand, are much easier to pull off and will produce outfits that hint at the Mediterranean – even if you’re barbequing beneath angry skies. Nailing the choice of shorts is key: on or below the knee and you look like you’re on safari; too high up the thigh and, well, you’re wearing short shorts. And not even a bespoke Italian blazer can salvage that look. You also want to avoid appearing too matchy-matchy. Cream shorts and a navy blazer will draw the eye to your torso, not your pins, and make your legs appear more tanned. On which note, if you haven’t recently been away on holiday, a bit of fake tan or bronzer pre-unveiling will hide a multitude of sins while adding definition. A combination that has seen its popularity soar in recent years, teaming a gilet with a blazer nods to spring’s unpredictable weather and helps dial down the formality of tailoring. If wearing a full suit, the gilet should go over the top of the jacket. It’s important to opt for neutral or subdued hues here; a big block of colour that ends abruptly at your shoulders and waist does no favours for your physique. However, separates offer more leeway. Keep the look dressed-down and relaxed – this is the place for an unstructured or unlined blazer, not anything too formal or full of shoulder padding. Throw a lightweight, technical gilet underneath for a contemporary twist on the waistcoat that will keep you warm on cooler days. Feel free to play with the colour of the vest as, like the T-shirt, there’s less on display and the blazer’s naturally tailored shape will ensure you don’t appear too boxy.